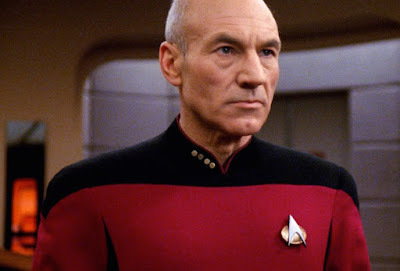 Jean Luc Picard will engage Star Trek firefights and conflicts with an energizing buzz. We need a character like Patrick Stewart to do this for I believe after 178 episodes of Star Trek TNG, only the Picard can "make it so" for fans! Look at the original ST TNG episodes. Characters wait to hear what he's going to do/say next when crises hits. I personally can't wait, You know the Picard's orders "make it so" is going to be so right! I mean he's the only captain who drank green whiskey with Scotty (Jimmy Doohan) on the bridge of the classic USS Enterprise NCC 1701. Okay so it was a holodeck, no bl**dy A,B,C or D but as ideas go don't you feel wowsered? I will be shelling out money to see that show! Ulp! CBS All-Access is about to assimilate me! The ought to be fun. It is the scifi equivalent of Federer winning Wimbledon. All is as it should be. The announcement about Picard's return was pretty much the greatest news I've heard recently. ohboyyohboyohboy....So looking forward to this!! Which Actor Confessed a Secret Ambition?